Blue Heroes have always been a force to be reckoned with in Star Wars Destiny. All the way from the magnificent successes of Eric Wainwright's Padawans to Mike Gemme aka Bobby Sapphire of The Hyperloops' badass eRey/eAayla/Profitable Connection deck that was adapted and modified by Mads Utzon taking down the European Championship 2018 just a month after becoming runner-up at Worlds 2018. Sure, the power of the monoblue heroes have been declining over the last few sets, but they were always there to gatekeep. With the release of new expansions, and the nerf to the undercosted Aayla Secura, blue heroes have gone through a rough patch, and although eAayla/eKit Fisto, eYoda/eQGJ2, etc. have all been powerful pairings in their own right, they've never managed the duplicate the successes of earlier blue hero decks. Throughout all this time though, no-one could ever disregard the presence and power of monoblue heroes. Rotation though is threatening to put blue heroes under immense pressure and they might just end up in the ash heap of history. Past glories all but forgotten. Why? Well ... this all started with a "Chat 'N' Play" recording Mads Utzon and I did for the YOUR Destiny YouTube Channel. I was testing eAayla/eKit Fisto and started off by asking Mads whether or not these monoblue hero character pairings were going to have any place in the top tier after rotation, and he was pretty grim in his prediction, stating the following (paraphrased): Playing monoblue Heroes was never about the characters, but access to the powerful events and upgrades! Were staples in almost any Monoblue Hero deck. Now, it's of course important to point out that there are blue hero characters in many decks, most prominently Yoda as a support character in every hero deck imaginable. Nobody is saying that blue hero characters are going anywhere anytime soon. What this article is going to examine, is whether or not, blue heroes in the shape of Melee based midrange decks is going to disappear from the top of the meta. Seemingly the easiest thing to replace will be upgrades. Although some are incredibly powerful due to abilities, they are mostly formed around the same template: Two to three Melee damage sides, Resource side, Shield side, maybe a Special and a Blank. They are usually 2-3 resources to play. 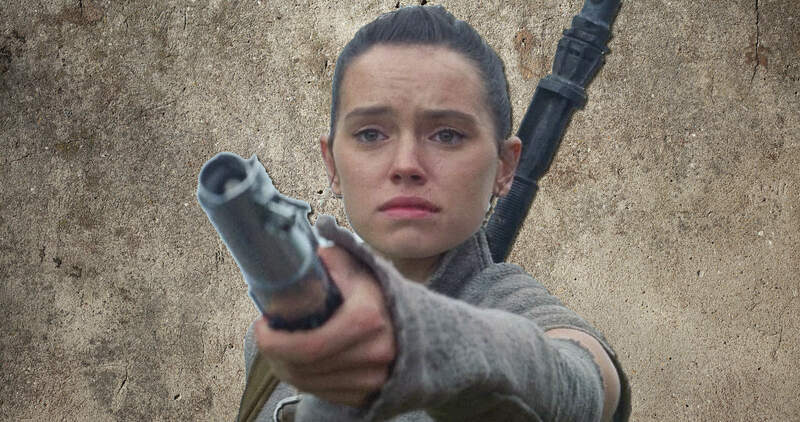 Awakenings did not have a single blue 2cost weapon upgrade and the best thing around was Rey's Staff which at the time sufficed, but was pretty mediocre! Spirit of Rebellion saw the Vibroknife released, and although it wasn't a blue card, it became a midrange deck favourite due to the scary ability to make melee damage unblockable, which was later errata'ed, but it wasn't until Empire at War that the good blue 2cost weapons arrived. Both Ancient Lightsaber and Shoto Lightsaber immediately became staples in any blue hero decks and while they are by no means irreplaceable, they served blue heroes pretty damned well. The ability to heal with the Ancient Lightsaber has won me more games than I can recall while the double Shoto Lightsaber combo could swing almost any game in your favour. Most importantly, both of them are non-unique weapons, which made two of each an auto-include. Their direct replacements are good, with the Crafted Lightsaber being the worst although boasting an incredible die and the Treasured Lightsaber currently one of my favourite 2cost weapons. Treasured Lightsaber might not have any base damage sides, but the ability to draw a card when played coupled with the unblockable damage makes it a pretty scary weapon nonetheless. 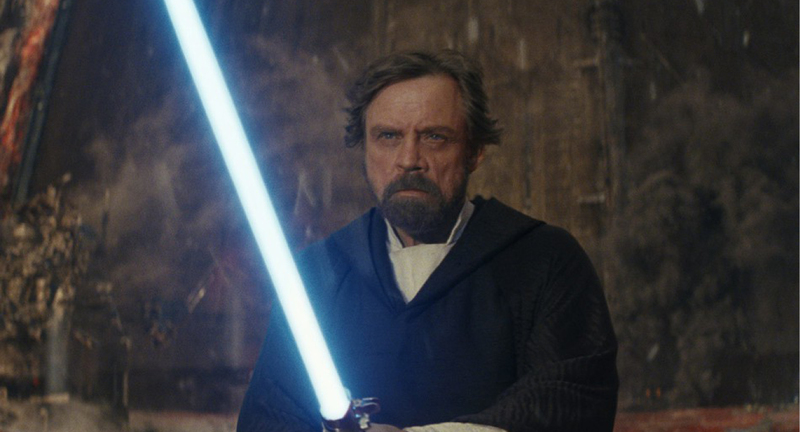 Luke Skywalker's Lightning Rod didn't cut it for a lot of monoblue hero players because it doesn't interact with the Shotos, but with the latter rotating out, the Lightning Rod looks as a strong must include, with or without Luke. Redeploy on Ezra Bridger's Lightsaber is sweet, but with both Luke's and Ezra's being unique weapons, you are still looking at an severely reduced card pool of good 2cost weapons, which means you'll have to dig into more 3cost weapons, which in turn alters your cost curve significantly. The three preferred 3cost upgrades have so far been the three Redeploy weapons, and will probably be for the foreseeable future, unless things are going to change dramatically in which case it might be worth finally looking into Built To Last style decks! 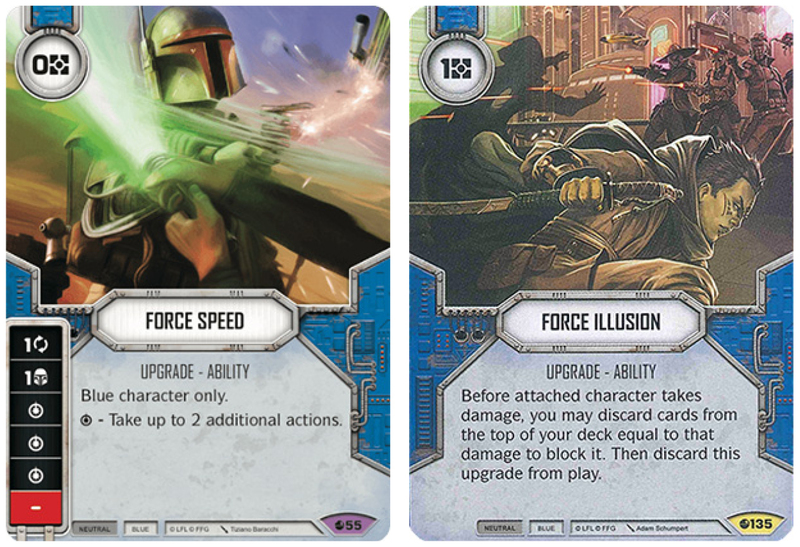 Both Force Speed and Force Illusion were vital to blue heroes and I feel that both, but maybe in particular Force Speed will be irreplaceable for decks that rely on loads of dice in few activations to push through damage to defeat an opponent's characters. We will most likely NEVER again see a card like Force Speed, and it is a testimony to how broken it was from the beginning. It looks as if blue heroes are going to take a massive hit on their access to events. Up until now, blue heroes have been endowed with access to some of the finest events the galaxy had to offer. Pacify being the strongest of the new arrivals and although arguably more flexible than Caution, it still feels like the weaker of the two in a direct comparison in a midrange deck. Beguile has quickly become a favourite for many players, and while it's strong, it has so far been in the periphery of midrange decks as a one-off if played at all. Unbreakable (or Mislead) are certainly MUCH WEAKER than Overconfidence and at the same cost. Other events that will be sorely missed include ramp cards like Destiny and Reaping the Crystal, with the former likely to be one of the fundamental pillars of the success of Mads Utzon's version of eRey2/eAayla, as well as the trusty Synchronicity, that has murdered characters cowering behind shields across the gaming tables everywhere. But the card that will be missed the most is without doubt: Close Quarters Assault. This was the card that allowed melee decks rounds where they would almost certainly kill a character. And blue hero midrange decks were the kings and queens of the Close Quarters Assault only rivaled by eKylo2/eAnakin. NOTHING could wreck an opponent's round like a well-timed CQA! This card will most likely not be reprinted - and for good reason - and will be sorely missed. Obviously, we do not know what Convergence and future sets have in store for us, but I fear that the decline in power of blue heroes will continue for a while, and at the very least, there will be a time of reinvention.